The box is 46" by 25" deep and about 2ft. tall and on one side is an 18"x18"x36" cage on the other side is a 24"x24"x48" cage. The door has two sets of hinges and opens up from the corner outward, this is because of the middle part of my closet which is built in and cannot be taken off. Inside the box are regular home depot buckets that sit underneath the drains which are just regular sink or bath drains. The drains themselves are attached to shower liner and this covers the top of the box where the cages sit on top of. There are 17"x17" holes cut underneath the liner so that the drains naturally weigh down the liner forcing the water to go down into the buckets. To clean up the liners and after they lay excrement I just take some clorox wipes and wipe it all down, very simple and pretty hassle free besides the tight squeeze. I know this forum and many others helped us in designing the whole area and habitat, and I can say my guys are much happier because of it. It is also less work I have to do which is a huge plus. Can anyone think of a (reasonable priced around $50) drainage system for a 4x2ft free range. I wanted it to be giant, but I think I'll probably have to downgrade to a 2x2. Multiple large plastic bins underneath, just cut the holes in locations not near where they meet. Not sure if that works or not without seeing any pics or better description. 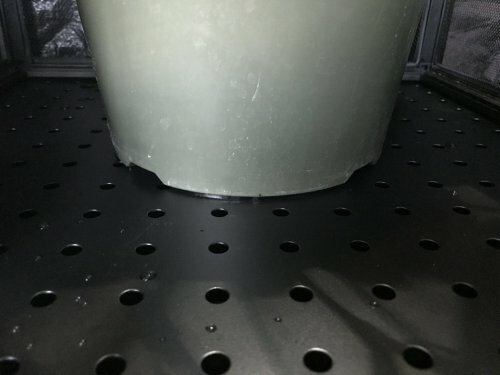 I took the substrate tray that comes with a Reptibreeze, flipped it over, and used a heat gun & some weight to shape it into a sloping floor that leads to a plastic drain in the center. Shown here without the drain. For that I just cut a hole in the middle and added a $2 plastic snap-in drain. The aluminum floorboards. Demonstrating how it flexes like a rug so you can get it in and out. Right now it drains straight into a 2 gal bucket placed under it. I might run some hose from the drain so I can move the bucket to one corner and maximize space on the shelf under the table. My little one is living in a small 16X16x30 enclosure for now since he is about 4 months old now. 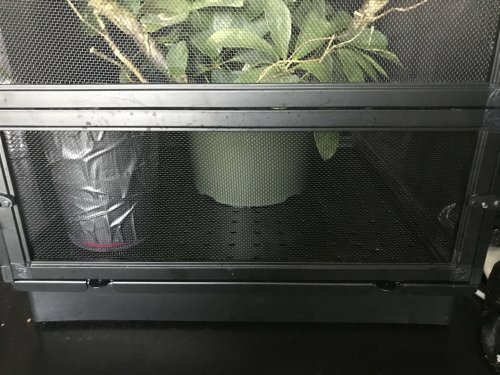 I took the bottom off his reptibreeze and found this tray at lowes that happens to fit perfectly on the bottom of his enclosure. I put his regular substrate tray underneath that then. I need to build a little platform for the enclosure to rest on so I can just pull the substrate tray out to dump... but seems to be working for now. Is having this type of bottom ok? It's metal. I can't see anything wrong with that. It's creative, it's strong, and it doesn't get funky because it's easy to clean. I would probably hot-glue a square of screen mesh over the plate to keep bugs from disappearing out the holes. Any suggestions for a drainage system for an XL reptibreeze cage? Right now we have a bunch of plastic containers under where the drips are. I purchased a cheap vanity with top at The Home Depot. It was $80. Drilled small holes in the bottom of the Rebtibreeze screen cage and it drips into the sink and then down into a small rubbermaid trashcan I have underneath where I also keep all of my supplies and bugs. I have a laybin in with one of my cages , it keeps seeming to puddle even though I have a hole in the bottom, and I’ve taken it out to dry before with a blow dryer, while rotating the sand to try and keep it that “diggable texture”, I was just wondering do you guys have some setup examples of how your drainage works for a permanent laybin ? drain for glass bottom cage? I have a 2'x2'x4' glass and mesh cage with a glass bottom. Doesn anyone have any ideas on how to create a drain in the bottom of the glass? I could make a false bottom but that would reduce the area for Hercules and seems like it would have to be a pretty large false bottom to capture an adequate amount of water. Thanks! Not ideal, but you could invest in a cheap aquarium pump to suction the water out of a collection tub. Just one of the ideas I'm considering although I don't have a glass bottom cage, I use large plant drainage saucers. I have to remove the plant and then empty the saucers manually.